Often thought of as a professional version of Facebook, LinkedIn has a lot of potential for anyone who is trying to build a brand. If you really want your legal nurse consulting business to stand out, start making more connections on this popular social network – LinkedIn. This is one social network you must use, even if you don’t use others. The best practices to work into your LinkedIn and other social media plans. How to use use images in updates and how to help your audience find you. Some best practices and important tips to help you stand out on Twitter. How to look for a group or a person to connect with on linkedin and other social networks. Why you should use Twitter ads also Twitter pics, and even video for your twitter promotions. 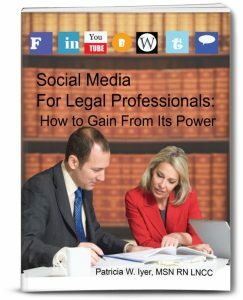 Social Media for Legal Professionals is specifically written to address the power of social media in helping LNCs attract clients. You’ll use it to discover how to use common social networks so you can decide where to invest your time. Pat Iyer has been a legal nurse consultant since 1987 when she first began reviewing cases as an expert witness. She achieved national prominence through her texts and many contributions to the legal nurse consulting field. She has been using social media for the last dozen years.